Your upcoming movie Hell Town - in a few words, what's it going to be about? Hell Town is a soap-opera slasher film set in a small American town. Two families clash over love, fortune, and betrayal; all the while a serial killer offs the football team one-by-one in gruesome and horrifying scenes. Imagine the love child of Heathers and Nightmare on Elm Street. How did the project come together in the first place - and perhaps connected to that, what can you tell us about your co-director Elizabeth Spear, and how did you first hook up? Elizabeth and I first met at a very surreal lunch with Rutger Hauer at a film festival in Texas. We instantly bonded over our shared love of melodrama and murder, backstabbing and betrayal, over-the-top storylines and horrifying death scenes. Hell Town is described as "part soap opera, part slasher film" - quite obviously, you have to elaborate on that! In this era of Netflix TV-series binge watching, we thought it would be a fun concept to treat the film as if it were three episodes in the middle of an already established TV show. We�re billing the film as episodes 7, 8 and 9 from Season Two of Hell Town. Complete with cliffhangers at the end of each episode. How would you describe your film's approach to horror (as in atmospheric vs all-out gore, suspense vs sudden shocks, dead serious vs tongue-in-cheek and the like)? I�d say we�re doing a mix of all of the above. There are moments of totally disgusting images, while other times it�s more suggestive and atmospheric. Likewise, there are sequences that will build some great tension and suspense, and then some awesome surprise/shock moments. What can you tell us about your film's intended look and feel as such? Although the overall tone is slightly tongue-in-cheek, it isn�t parody at all. We�re treating Hell Town very seriously. The blacks will be inky black, with vivid colors, and top-notch cinematography by Daniel Stephens. Do talk about your tentative cast for a bit, and why exactly these people? I�ve worked with Oscar winners and Golden Globe winners like Karen Black, music icons like Mike Patton (Faith No More), Kevin Richardson (Backstreet Boys) and Jane Wiedlin (The Go-Go�s), cult icons like Mink Stole, and paired them against total unknowns discovered in small-town USA. For Hell Town, Elizabeth and I wanted to form a group of fresh faces for the primary cast and then add cult performers like Pleasant Gehman or Betti O. in the special guest parts.I'm thrilled to be working with relative unknowns fresh on the scene. These performers are incredible. You'll see. As far as I know, Hell Town is currently in its fundraising stages - so what can you tell us about your fundraising efforts? It�s going great so far! In addition to Indiegogo we�re also gathering a nice group of outside sponsors who will help make Hell Town a community event. So that everyone involved is part of the team and will really feel included in the project. Once your funds are raised, how do you plan to proceed, and any idea (however tentative) yet when and where the film might be released onto the general public? Filming takes place end of May and beginning of June 2014. In my experience releasing previous movies, it usually takes about a year from the time of the shoot before someone can hold a DVD or stream VOD. But, sometimes it happens sooner. Any future projects beyond Hell Town you'd like to share? I�m working on a top-secret project with Susan Traylor, so I can�t really talk about that. 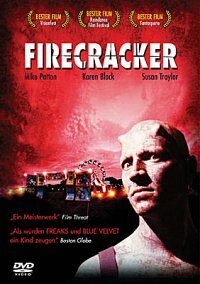 But, I can tell you I�ve recently made my first mainstream film Firecracker (starring Karen Black) available on Vimeo On Demand. Even though it was released globally in 2005 and the late Roger Ebert named it on his list of that year�s best films, it�s impossible to find. And the Vimeo platform is really brilliant. Since a kid, I�ve always been doing it. But it wasn�t until after I went to CalArts film school that I started to take it seriously. I'm not a huge fan of film school. I think I learned more by actually making films than I did studying them. What can you tell us about your filmwork prior to Hell Town? Pep Squad was my first film, which was a satire about American school violence. We were in talks with a major studio to release the film when the Columbine high school massacre happened, and then it got shelved and no one would touch it. It ended up coming out two years later in 2001. In the years since, I�ve made 11 movies. Firecracker , which I mentioned before, Watch Out was a festival favorite; Casserole Club was invited by the US Library of Congress for its permanent collection; and Culture Shock and Far Flung Star were filmed in London and Paris, and Hong Kong, illegally without permits! Hitchcock is my favorite. I also love all of Kubrick�s movies. So inspirational. It�s a toss up between Vertigo (Hitchcock) and Night of the Iguana (John Huston). I don�t like movies that are treated like music videos. You know, the ones that have hardly any storyline and are just made up of montage scenes set to various songs that seem to start as soon as the previous song ends. My blog: www.SteveBalderson.com has articles on filmmaking posted every Wednesday.